We took organic fresh-brewed coffee and grounds, and dropped a little mint and honey, to create a bar of soap you'll look forward to waking up to EVERY morning! We decided to call it 6 AM, because it's everything you need to get going in the mornings. When you're trying on perfumes, there's usually a bowl of coffee set out to neutralize one scent in your nostrils, so you can get the full spectrum of another, right? Well, soaps containing coffee work the same, but to a larger degree. 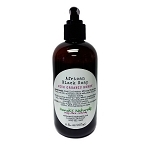 Our 6 AM soap is perfect for neutralizing body odor, detoxing 'pits prior to using our deodorants for the first time, after cutting up garlic and onions, or anytime you've got dirty, smelly hands that could use a good cleaning and deodorizing. You'll notice little brown specks in your soap. These are coffee grounds. Finely ground coffee makes for an effective, yet gentle exfoliating AND deodorizing experience. 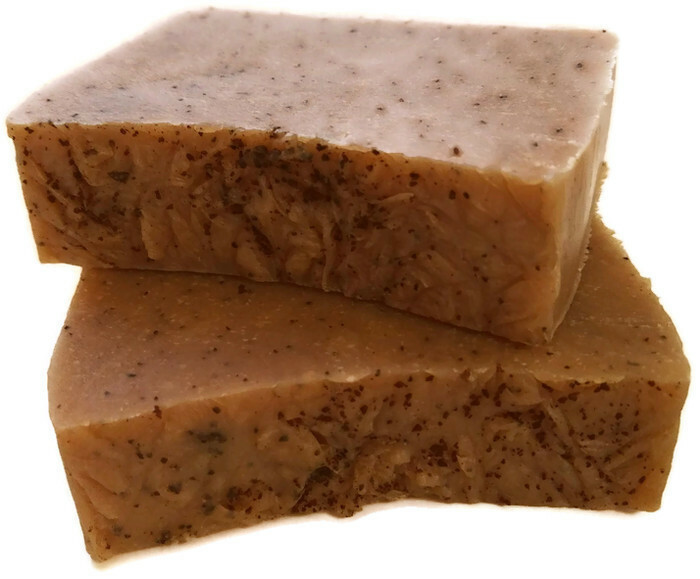 Coffee has also been used as a facial toner to tighten skin and smooth wrinkles, making this soap highly versatile. 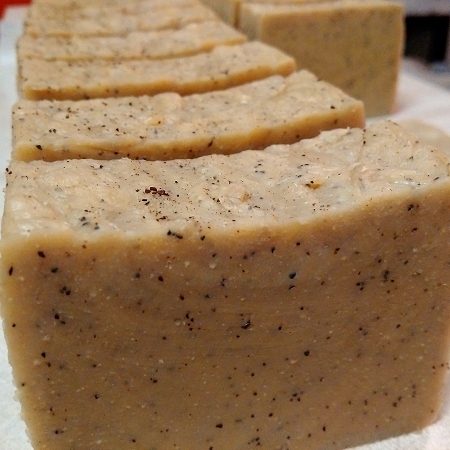 I love using our 6 AM coffee-infused soap to gently slough away winter skin. 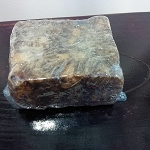 Nandi's Naturals soaps are handmade using the hot-process method, which requires the use of lye to saponify the oils. The saponification process turns the oils into soap. When done correctly, there is no lye left in the final product. To ensure that the soaps undergo proper neutralization of lye and evaporation of water added during the processing phase, our soaps are left to cure for a minimum of 1-2 weeks. Full curing ensures a hardier bar of soap, lustier lather and a decreased likelihood that irritation will occur. Our hot-processed, handmade soaps retain their natural glycerine, a valued skin protector and moisturizer. We prefer to handcut our soaps, so each bar will be unique and comes individually wrapped. *The base price is for one bar of soap. *Used to saponify the oils. Does not remain in the final product. ** Contains brewed coffee and ground coffee. Tips: Extend the life of handmade soap by allowing the bar to dry completely between uses. Don't leave in standing water or the direct spray of the shower.